At the March 2016 AgVocacy Forum in New Orleans, Rob Schrick, strategic business management lead – horticulture at Bayer CropScience, noted we should n ever give up trying to AgVocate on behalf of the agricultural industry. “It goes back to the pebble and the ripple, which is what Braedon Mannering, founder of Brae’s Brown Bags talked about; you know, little things can matter,” Schrick said. Braeden Quinn Mannering is an amazing 12-year-old from Bear, Delaware, who founded the nonprofit, 3B Brae’s Brown Bags (3B), to provide healthy food and other items to homeless and low-income people in his community. Mannering’s ongoing mission is not only to feed people today, but also to raise awareness about the problems of food insecurity and poverty and to empower and inspire youth across the nation to become part of the solution. “One of the most interesting things we saw at the meeting,” Schrick noted, “was that we are influenced by people all around us, doctors, lawyers, and our pastors. However in agriculture, the number one influencer is the grower. That really resonated with me and it is true; he is the most credible source, he is the one who produces that food, and he has to make that land he is working on sustainable. He has to make that production come, year after year, after year, and in most cases, he wants to turn that over to the next generation of farmers. Schrick expanded on the grower, “I think because they are at the point-source, their livelihood depends on it, and they have to get more out of that land and make it more fertile each following year, who is better stewarding that land? And because of that, who is the most credible source?” he asked. “You know, I would love for [the credible source] to be a company—like Bayer; we are very proud of ourselves. Or you could talk to a consumer, [but the story] is going to have a bent to it. But when a grower is talking about production agriculture, that is pretty credible,” he said. “At Bayer, our customer is the grower,” Schrick commented, “and we have to meet the needs of that grower. Well that grower is producing a crop and he has a customer, which is the food chain. These retailers, these food processing companies that are buying his product, are putting requirements on that grower. We have a food chain position on our team and a Food Chain Partnership coalition within our company, whose number one job is to understand what these food processors will require the grower. We understand that; we can help the grower meet those challenges; that is what our food chain partnership is all about. It all goes back to the pebble and the ripple effect. Bayer CropScience will honor a leader in the produce industry whose thinking, practices and use of technology enhance the role of produce in creating better lives. The Bayer CropScience Produce Innovation Award will recognize a grower whose innovative efforts improve yield and quality of a produce crop; increase accessibility of produce to a broader group of people; or increase demand for produce by expanding awareness and appreciation for the health benefits of fruits and vegetables, including tree nuts and potatoes. Bayer announced the new award program during the Produce Marketing Association’s Fresh Summit Convention and Expo in Anaheim, California. Entries will be accepted now through January 5, and the winner will be announced during Bayer’s 10th annual Ag Issues Forum, being held February 24 – 25, 2015, in Phoenix, Arizona. The award is open to any grower who receives a significant portion of income from the production of a crop within the citrus, grape, pome fruit/stone fruit, tree nut, vegetable or potato industry. The winner will receive an all-expense paid trip to the 2015 Ag Issues Forum in Phoenix, a $10,000 grant to advance their award-winning innovation or to support a project in their local community that also increases the positive contributions of produce in people’s lives, a $2,000 gift card to the Apple Store to further efforts in business technology, and recognition as a produce innovator. “We are looking for individuals and operations who aren’t afraid to try new things and who embrace technology to advance the industry and enhance the positive contributions of produce,” Schrick said. Bayer CropScience aims to leave a better world, harnessing cutting-edge agricultural innovations to deliver on Bayer’s mission: Science For A Better Life. Bayer’s Horticulture group offers customized, integrated crop solutions based on high-quality vegetable seeds, effective chemical and biological crop protection, and complementary services. 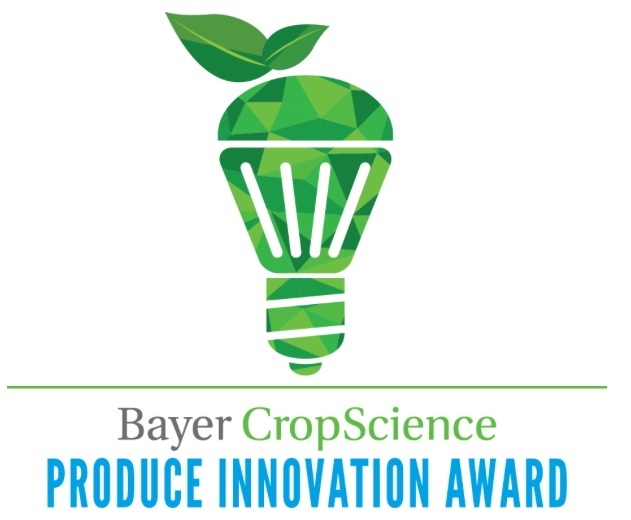 Visit www.bayercropscience.us/ProduceInnovationAward for more information or to submit an application. See official rules for more details.